Special Buyer Discount: Buy four, get one free! When you add four patterns to your cart, the least expensive one will be FREE! Support Us on Patreon: Love our work? 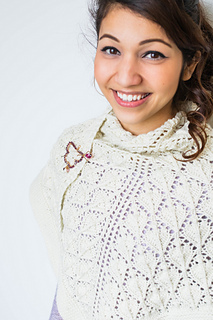 Want to support Aroha Knits on a monthly basis? For as little as $2 a month, your contribution helps us with the backend bills and fees it takes to keep us running. For $5 a month, you can get your choice of any pattern for FREE. Sign up here to become a Patreon today. 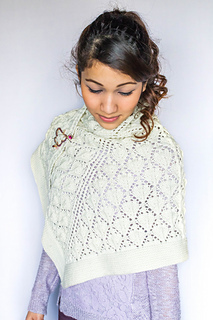 Arrival of Spring is part of the Spring Shawl Collection. 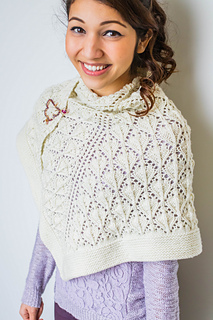 This shawl features an allover lace design with a garter stitch border worked in a 3/4 shawl construction. Spring is slowly blooming, the last remnants of winter are melting away. The sun shines longer and brighter, birds are returning home, and the first tiny green buds are peeking through the leaves. It’s the Arrival of Spring. This shawl is very easy to knit up in any weight or fiber, and can be made as big or as small as you like. 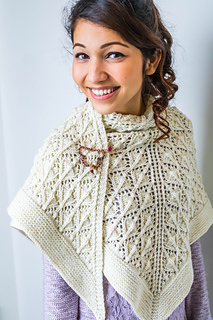 A very meditative knit to help comfort the mind, and delight the needles, you will be wrapping yourself in this cozy shawl in no time, to help chase away the last flutters of winter. 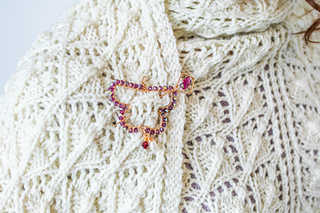 This pattern has been tech edited and test knit to ensure that the pattern is as error free as possible. We want you, your yarn and your needles to experience an enriching, engaging and exciting knit. Needle: US size 6 (4.0mm), 32” (81cm) circular needle is recommended in order to accommodate the large number of stitches. Yarns Used: Nurturing Fibres SuperTwist DK (100% Merino ; 50g ; 103meters/112yards). 8 skeins used in color way Vanilla. Gauge is not crucial to this project, but varying gauges will affect final measurements and yardage used.